A few weeks ago somebody asked me if I really liked yellow. At the time I was a little confused, "Why do you ask?" I said. "Every time I see you you're wearing yellow," she said. At the time I passed it off as a good combo for the green I often consciously wear, but as I though about itI saw she was right - yellow is creeping more and more into my wardrobe. Nor is it the first time. 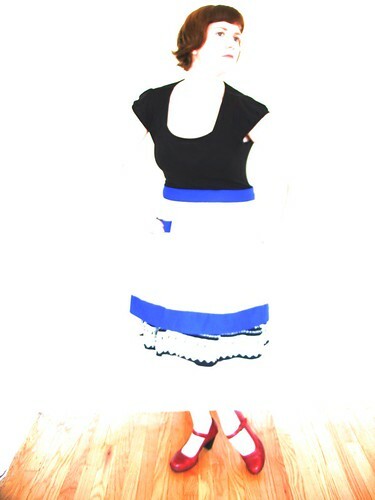 The first pair of shoes I ever really got excited about was a pair of bright yellow Adidas with blue stripes I had in high school (the school colors at that!). 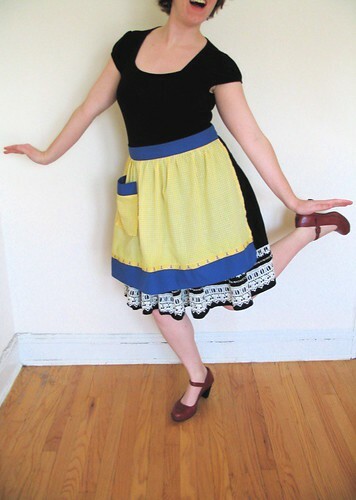 This apron's life started shortly after Christmas when a co-working, hearing I had made an apron for a Christmas gift, asked me to make her one before the summer was out. Being as this co-worker is the #1 best thing about my current job and I was given a long lead time, I happily agreed. Fast-forward several months later and I'm in my favorite fabric store where I discover this fabulous section I'd never looked in before: Ribbon. Spools upon spools of fantastic ribbon! First, I spotted some lovely cherry ribbon, which I snagged a few yards of, then I saw this bee ribbon and it was all over for me. I practically had to run out of the store to prevent coming home with a car load of ribbon, it was all so wonderful. 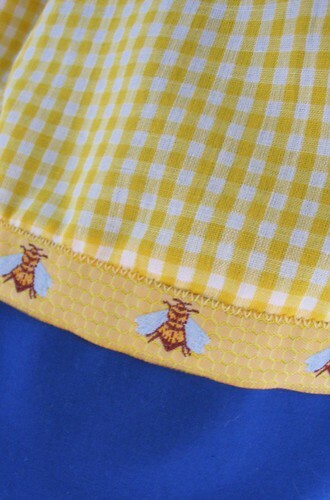 Of course I knew bees and cherries would make perfect adornments for that apron I had agreed to make and so I picked out the blue and yellow gingham you see above to complete the project.